Gin is not dead. Hope I didn’t spoil the plot or anything, but I had some last night and it was quite tasty. Very herby. And junipery. In fact, you could argue that, with the recent births of a number of high quality US gins and the global relaunch of Bols Genever, that gin has never been in better health. But I’m not one for arguing, and anyway, of course it has. 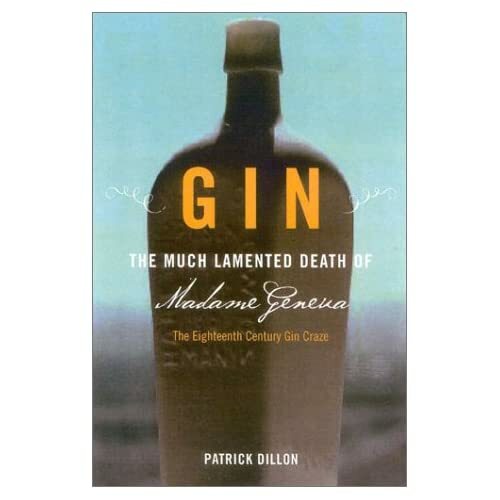 Patrick Dillon‘s book is concerned with the period of time known as the Gin Craze, the mania that accompanied London’s fixation with cheap spirits in the 18th Century. In 1743, the stills of the capital produced 2.2 gallons of the stuff for every man, woman and child in the city, which still wasn’t enough for Judith Defour, who left her child naked in a field while selling her clothes in order to buy more gin. Such excess couldn’t be tolerated and Dillon tells of the attempts to bring Madam Geneva to heel. Of course, not all of those attempts were intended as a moral cleanser. The First Gin Act of 1729 is weighed against Robert Walpole’s search for “enough cash to buy off a king” while the Act that actually worked was not one of prohibition, but one that would allow the Government to incrementally raise the revenue it gained from spirit production. Dillon provides a useful chronicle of how societies deal with new drugs: first there is wild consumption set against staunch moral outrage, followed by prohibition and widespread lawlessness, and finally, the intervention of central government once a potential revenue stream is identified. This is how drugs move from illicit through illegal into acceptability. The Much Lamented Death of Madam Geneva is a fantastic book, accessible yet packed with detail. For anyone interested in the history of spirits, it shows how the industry has moved from Hogarth’s Gin Lane to something looking a lot nearer Beer Street. Here’s what I know about Cuban independence. It turns out you can write entire books on what I don’t know about the history of Cuba. Helpfully, Tom Gjelten has done just that and he’s even made particularly relevant to the likes of me by looking at the subject through the lens of the Bacardi family.